The sticker price for the base Sonic sedan is $13,735, plus $760 for freight — $14,495 total. The dealer holdback on the car is 3 percent of sticker, $412.05. 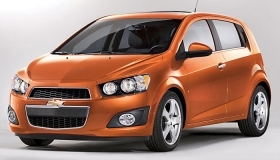 DETROIT -- Finding a base, no-option 2012 Chevrolet Sonic sedan will be impossible, I predict. Why? The numbers for a base car just don't add up favorably for a Chevrolet dealer. But the base sticker price makes good ad copy. The Sonic is Chevrolet's new subcompact. The car replaces the Aveo and has received very good reviews from the automotive press since sales began in August. The car is well equipped, including standard air conditioning, power doors locks, 10 airbags and a long list of other equipment. A five-speed manual transmission is standard. The sticker price for the base Sonic sedan is $13,735, plus $760 for freight — $14,495 total. The dealer holdback on the car is 3 percent of sticker, $412.05. Any kind of floor planning assistance the dealer might get from the manufacturer isn't included here. Here's where the numbers get interesting. The invoice for the base Sonic sedan is $13,391.63, giving the dealer a $343.37 margin, assuming the dealer sells the car at sticker. Then there's the cost of advertising. If the dealer participates in a Chevrolet metropolitan advertising association, depending on the association, the dealer pays 0.5 percent to 1 percent of sticker price per vehicle, according to General Motors. In this example, the cost to participate would range $68.68 to $137.35 per car. Subtracting that from the margin, that leaves the dealer with between $206.02 and $274.69. The holdback adds another $412.05, which brings the total to 618.07 to $686.74. But out of that come the expenses of running a dealership, such as floorplanning costs, office expenses, taxes, staff salaries and all the rest. So how many base, no-option Sonics will most dealers sell?